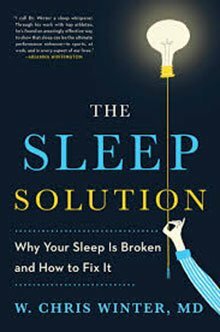 If you have problems sleeping you should read The Sleep Solution — Why Your Sleep is Broken and How to Fix It by Dr. Chris Winter. Most nights my sleep is “fragmented” — meaning that more nights than I like, I frequently wake up and when I wake up I experience problems getting back to sleep. Dr. Winter’s book helped me understand why my sleeping pattern was broken and what I need to do to improve the quality my sleep. Later in the article, I describe my personal journey to fix my sleep using Dr. Winter’s book. Dr. Winter’s book is much needed, especially for those of us in search of better sleep. I have read many blog articles on sleep and, for the most part, I find them repetitive and uninformative. They tell you that your health is at risk if you do not sleep, that you need a certain number of hours of sleep per night, and finally that you should sleep in a dark, cool room and not take your computer or iPhone to bed with you. The problem is that the people who read these articles usually have sleep problems, often follow all of these guidelines and still cannot sleep. The reader is left with a sense of failure and anxiety — which furthers the sleeping problem! Dr. Winter does not take this approach. He insists that you read the book from beginning to end so that you learn the basics of sleep and understand what is happening to your sleep. Instead of simple and obvious rules, he challenges the reader with two facts. First, many of us dysfunctional sleepers insist that they do not sleep and have not slept for years. How can that be true? If, every night, you did not sleep, you would likely be dead — but you are here, reading this article I have written, and very much alive. Second, we have an emotional relationship with our sleep. Most of the problems we have with sleep stems from the dysfunctional relationship we have with our sleep. (Sleep problems cause by physical issues such as apnea are different from emotional issues and demand specific treatment protocols). As a result, Dr. Winter encourages the reader to come to terms with this relationship and, like any relationship having a tough time, put some effort into making it work. Dr. Winter has treated thousands of patients for various sleep disorders. He spends a significant amount of his time educating patients on the basics of sleep and this book was written as a reference guide for his patients. We are fortunate that he published the book and made it available to you and I, the general public. For a modest price, you can access much of the information he shares with individual patients. Delivers a comprehensive explanation of how sleep works. He covers the stages of sleep and why they matter, how circadian rhythms work, and the chemical foundations of wakefulness and sleepiness and how the two states compete with each other to keep you awake or put you to sleep. Addresses many of the myths and misunderstanding about sleep that confuse many of us with sleep problems and the physicians who treat people with sleep problems. Clarifies the difference between sleep deprivation and insomnia. This is one of the most important parts of the book. Instead of attempting to explain the difference in this blog post, I will leave it to you, the reader, to read his book to learn about this topic. Dr. Winters does a far better job than I ever will explaining this complex issue. Asks the difficult questions about their sleep and challenges many of their beliefs. I feel that this discussion is one of the most important contributions of this book. The better understanding you have of your sleep behaviour, the greater the chance that you will fix your sleep problems. Presents the latest research available on sleep and, where pieces are missing, he fills in with his own informed opinions. The Sleep Solution is broken into two major sections. The first section is an introduction to sleep medicine and the second section (after an “intermission”) addresses sleep problems and how to deal with them. Dr. Winter provides a thorough explanation of sleep in the first section of the book. By now most of us know that sleep is important to our health and that poor sleep can detrimentally affect our heart, mood, immune system, and brain, can lead to weight gain, and has been linked to cancer. He covers each of these issues but, thankfully, he does not overdo the message. On the other hand, he does point out several important new findings from recent research on sleep and the brain. For example, in 2015, University of Helsinki researchers Antoine Louveau and Aleksanteri Aspelund found that the brain has a system for removing waste called the glymphatic system (1). This system is 60% more productive when we sleep as compared to when we are awake. Removal of waste products in the brain plays an important role in long term cognitive well-being. Sleep is essential to our survival. Dr. Winter points out that our brain insists that we sleep. Eventually, no matter how poor the quality of your sleep or how sleep deprived you are, you will fall asleep. You might find the road to sleep to be a rocky one, but sleep is something that happens to all of us (even Rolling Stones guitarist Keith Richards). Really? You might have restless nights, you might not like the quality of your sleep, but you do sleep. Some individuals, on the other hand, are sleep deprived. People who work night shifts are often sleep deprived. There are sleep tests that allow you to determine if you are sleep deprived and Dr. Winter provides several in the book. I completed each of these self-assessments and learned that I do, in fact, sleep at night. I just needed to work on improving the quality of my sleep. This book made me think about the difference between sleep deprivation, fatigue, and poor sleep. Understanding these differences is essential to the sleep remedies described later in the book. The chapter entitled Sleep Stages delivers an excellent overview of the structure of sleep and why it is important that your transition between the different sleep stages in the correct order. I appreciated the explanation of the different sleep stages when, later in the book, Dr. Winter discusses sleep studies. During a sleep study, the sleep technician generates a reading of your sleep pattern called a polysomnogram. I was able to leverage my learning from the Sleep Stages chapter to interpret the output from a polysomnogram. Once you have a firm understanding of your sleep, Dr Winter moves onto how to treat sleep problems. This is the second section of the book. Like many sleep specialists he discusses the importance of sleep hygiene. He also covers treating insomnia, sleep schedules, napping, snoring, apnea, sleep medications, sleep studies, sleep efficiency, sleeping aids and other sleep conditions. I have read several books on sleeping, including Say Goodnight to Insomnia by Dr. Gregg Jacobs, and feel that The Sleep Solution is the most comprehensive, practical, pragmatic and realistic of them all. As well as tips, self assessments and directions, it includes a number of surprises. For example, I was alarmed to learn in the chapter on sleep medications that the most common sleep medication prescribed by physicians is not even a sleep medication! It is an FDA approved anti-depressant: Trazadone. This is concerning. Did The Sleep Solution Solve My Sleep Problems? Several months have passed since I first wrote and published this review in July of 2018. The section you are now reading was added in September 2018 to update you on my personal journey with The Sleep Solution. Since publishing the review in July, a number of people have asked me if reading the book and employing the techniques provided by Dr. Winter improved my sleep. In other words, was The Sleep Solution the solution to my sleep problems? The answer is yes. The Sleep Solution worked because it did two things for me. First, the book gave me a better understanding of sleep. I learned that I sleep during the night. Unfortunately for me (and most problem sleepers), my sleep patterns are dysfunctional and my sleep quality is poor. Just knowing I do sleep at night (although it does not feel like I do) reduced my ongoing anxiety about my sleep. Second, I learned that dysfunctional sleep can be fixed through Cognitive Behavioural Therapy (CBT). Dr. Winter discourages the use of pharmaceuticals and advocates CBT as the path to good sleep. There is an abundance of clinical research supporting the effectiveness of CBT and, as a further bonus, CBT means you do not need to take medications or supplements to fix your problematic sleep. Dr. Winter recommends a protocol that is part of CBT he amusingly calls the “Ice Bucket Sleep Challenge”. No need to worry. No-one will be dumping ice water on you. The clinical name for it is “sleep restriction”. It is very effective but, I should warn you, it is not fun. The objective is to increase your sleep efficiency. I was spending too much time in bed and not enough of that time was spent sleeping. In other words, my sleep was inefficient. Here is how it worked for me. I restricted the duration of my time in bed to five hours and thirty minutes a night. I would go to bed a 12:30 AM and get up, whether I liked it or not (and most time I did not like it), at 6:00 AM. Although I felt groggy each day and wanted to nap, I didn’t. This protocol trains the brain’s clocking system, the suprachiasmatic nucleus, that a new sleeping pattern is in town. I followed this protocol every night — without exception. It took a week to 10 days until my brain and body capitulated and I eventually slept through my first full night of uninterrupted sleep in years. It took another 20 to 25 days before I settled into a regular healthy sleeping pattern. In total, it took over a month to regain control of my sleep. Once I felt confident that my brain was retrained and healthy sleep was established, I added 15 to 30 minutes to my nightly sleep. I found it very difficult staying awake each night until 12:30 AM. I like to read at night but found with this protocol I was unable to read because I fell asleep before my prescribed sleeping time. To stay awake, I went out late each evening for long, long walks. I not only fixed my sleeping problem, I added some extra exercise to my day. Pretty good deal! I recommend you do this protocol during the spring, summer or fall seasons when walking at night is accessible and pleasant. Also, I found it relatively easy to stay awake through the long and sunny days of July and August. Following this protocol during January and February in northern climates when the days are short and the light is low could be a challenge, unless you have access to a treadmill or exercise bike at home. If you are one of the lucky ones who gets away from the winter weather, perhaps now is your opportunity to fix your broken sleep while enjoying the nice weather! If you experience dysfunctional sleep and you know that the cause is not a physical impairment such as apnea, I encourage you to try this approach. I think that you’ll find that, as the French say, ca vaut la peine. You can purchase The Sleep Solution on Amazon in paperback. Please note I receive small commission from Amazon if you purchase the book. Dr. Winter is a physician, a board certified sleep-medicine specialist, and a board-certified neurologist. He has been involved in sleep medicine and sleep research since 1993 and is the owner of Charlottesville Neurology and Sleep Medicine clinic in Charlottesville, Virginia where he has been practising sleep medicine since 2004. Dr. Winter has done the poor sleepers of the world a great service with the publication of the book, The Sleep Solution. I encourage you to read it so that you can learn more about your sleep and how to make it better. The Sleep Solution is now available on Amazon in paperback. Visit my page dedicated to ageing well. Hi, I found this review interesting and may read the book. I would also like to put a plug in for another book, written by an insomniac, that helped me a lot with my sleep problems. “Desperately Seeking Snoozin’” was recommended by a respirologist in Ottawa who I saw after going to the sleep clinic at the Ottawa Hospital. In fact, she had bought dozens of copies of the book and gave it to everyone who came to her for sleep problems. The book is folksy and may get on your nerves occasionally but it was written as an act of love by John Wiedman, a self-cured insomniac who wanted to help others. It was my bible for a number of months and I still refer back to it when I hit a bad spell and can’t sleep for awhile. It is available on Google books and maybe elsewhere too. He also prescribes the identical cure as discussed in this review, of limiting hours of sleep by determining the minimum you need to get by (I had to stay up til 1 a.m.) and getting up at the same time every day. This was accompanied by keeping a sleep diary and preceded by writing a sleep biography to try to determine one’s problems. I no longer need to keep such strict sleeping hours, but I did do so for many months. Hi Peggy: Thank you for your comments and sharing the book that you found useful. I have a question about the book. With regards to sleep apnea, does the author merely repeat the usual “CPAP is the gold standard,” “try a dental device if you can’t tolerate CPAP,” “lose weight (if applicable),” etc. or does he have any novel suggestions for treatments? So excited to learn of The Sleep Solution. I am arguably one of the healthiest people in my circle — a girl with a quality diet, regular exercise regime, fulfilling work/social life, etc — but my missing piece has always been SLEEP. Insomnia has plagued me for 6 years for reasons unknown. The media and medical field have indeed added shame to the the issue… minimizing the gravity of unrest. “Try a hot bath and warm milk — that should fix things”. Their oversimplification of the matter is insulting. Sleep is such a fascinating, delicate, and underappreciated event. A true quality of life issue. I’m compelled to buy the book… Most grateful for this review and post. Hi Megan: Thanks for your comments. I agree that many of the articles you read on the web simplify the solution too much. Dr. Winters’ book provides the education and points to several viable solutions. Well worth the investment! Hi Renee: I did not cover sleep apnea in my review because it, as you point out, requires a much different treatment protocol. Dr Winters does discuss sleep apnea in chapter 14 and some of the interventions available. He points out that continuous positive airway pressure (CPAP) is the most popular treatment option. The other treatment approaches he mentions are 1) sleeping on your side, 2) oral appliances, and 3) surgery – which can be as easy as a tonsillectomy or as complex as a reset of the jaw. He does mention newer surgical options. I recommend you consult with a sleep specialist if you have sleep apnea. Thanks for your reply. I’ve already consulted with a sleep specialist who diagnosed me. All treatment options have been intolerable and/or ineffective. Even explored surgical options with a different doctor – don’t really qualify for surgery as considered to be “mild” even though I am tired and fatigued continually. I sometimes have some of the other sleep issues and rarely get more than 6 hours sleep max, although I do sleep. Fibromyalgia related sleep architecture anomalies may also be contributing. Thanks for your book review. I am sorry to hear that you are “sleep challenged”. It must be frustrating. Thank you for your kind comments. Thank you for your review, Richard. The Sleep Solution is on my reading list for future. Right now, I’m busy trying to help my 91-year-old mother. She still gets around but has a horrible time sleeping through the night. Does Dr. Winter discuss age-related changes in sleep patterns? Does he address situations such as overactive bladder? I agree whole-heartedly with his take on trazadone. I think it’s overused due to its affordability for mental health treatment. Any thoughts are greatly appreciated! Sincerely, Phyllis M.
Thank you for your reading the post and your kind comments. In his book, on pages 31 to 34, Dr. Winters discusses how much sleep we need and delves into how our sleep needs change as we age. He refers to research, done in 2014 and published in 2015, that examined sleep needs among nine different age groups. The study found that the amount of sleep we need declines as we age to the point where our elders only need seven to eight hours a night. When asked how much sleep we need, Dr. Winters responds: “Enough”. Not too little and not too much. I suspect if you were to ask him about your 91 year old mother, putting aside obstructive sleep issues like apnea, he would recommend the protocol I followed. He did not discuss overactive bladder as an issue; at least I could not find it. However, he does discuss antihistamines and their effect on dementia; as well as a medication to treat overactive bladder, oxybutynin, as another potential cause of dementia. Dr. Winters is no fan of medications as an answer to your sleep problems. He is a believer in you finding out about your sleep, how much you need, regulating your sleep and sticking to a schedule. If overactive bladder is an issue, you might want to consult a pelvic health Physical Therapist. They have tricks and strategies that can help you address this issue and not interrupt your sleep. If sleep is a concern for you I highly recommend Dr. Winters’ book largely because you will learn a lot about your sleep and he helps to eliminate much of the poor quality information available on the internet (not ours, of course! ).